Brief：China and Namibia have good cooperation in political, economic and military fields. 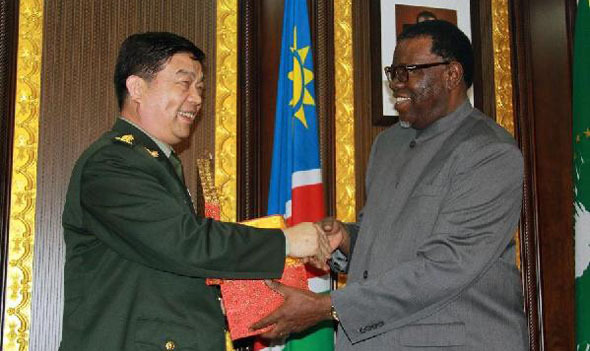 Namibian President Hage Geingob met with Chang Wanquan, state councilor and minister of national defense of the People's Republic of China (PRC), in Windhoek, capital of Namibia on March 30, 2015. Geingob said Namibia and China are "all-weather" partners and the two countries have been carrying out good cooperation in political, economic and military fields. Namibia appreciates the assistance China has been providing for years, said Geingob, adding that the Namibian government is dedicated to making the country to be more prosperous and stronger, hence hopes to get continuous assistance from China. 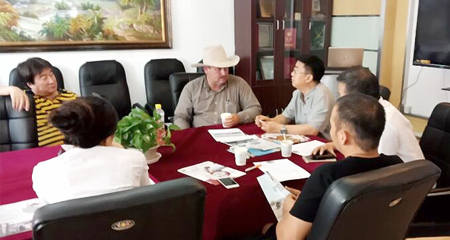 Namibia is willing to make joint efforts with China to push forward the state and military relations between the two countries and the two militaries, Geingob told his Chinese guest. Chang Wanquan spoke highly of the Sino-Namibian relations by saying that China and Namibia have become the "all-weather" friends with shared weal and woe since the establishment of diplomatic relations between the two countries 25 years ago, and the two countries have been carrying out fruitful cooperation in various fields. The Chinese side will positively implement the consensus reached by the leaders of the two countries and further deepen exchange and cooperation with Namibia, so as to put forward the relations between the two countries and the two militaries to a new level, added Chang Wanquan. On the same day, Chang Wanquan made an official visit to Sam Nujoma, the founding president of Namibia, and held fruitful talks with his Namibian counterpart.